New to the forums and Alerts, sorry for the newbie questions. 1.) If I assign an Alert to a Custom Group does it look at each device in that group individually and alert on them or does it look at the consolidated metrics and report on the group as a whole? 2.) 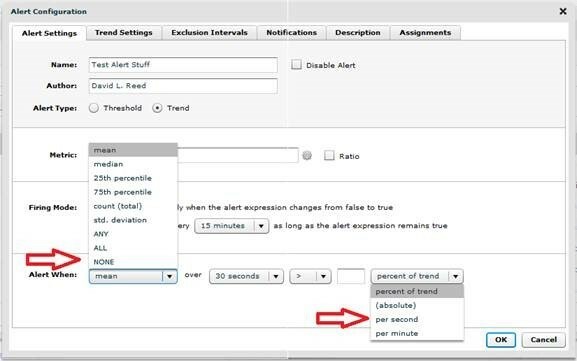 Regarding the “Trend Settings” tab, when using Same Hour or Hour rolling Average, when does the Alert fire; at the end of that hour? If so I assume that would be a bad choice when you’re trying to catch an outage? 3.) Regarding the “Trend Settings” tab, minute Rolling fires based off the configuration under Alert Settings? have an issue with Rcv Wnd Throttles Out over the last 2 weeks is showing an average of 2,063 a day. The issue is we had 2 days with big spikes; 5,356 and 13,254. If you exclude those the daily average is only 202 Rcv Wnd Throttles Out a day. Is there way to exclude the extreme spikes but still report on them when they happen? or standard deviation on the 1st drop down? I am tagging @optimus since I know that he’s done a ton of work with alerts.